Media surround a prison spokesperson during a news conference outside the Southern Ohio Correctional Facility in Lucasville, Ohio, on April 13, 1993, where some 450 prisoners at the maximum-security facility started a riot. Some of them I have worked with for decades; others for only a short period of time but long enough to know their quality. John Hanchette, Pulitzer Prize winner, former reporter for USA Today and Gannett News Service and retired journalism prof at St. Bonaventure University in New York, is one of them. Honest, I mean this as no slight to any of the other brilliant people I have worked alongside (and, in many cases, in competition with), but Hanchette is the best reporter I have ever shared a byline with. Certainly, the most resourceful. To him, every story was a Rubik's Cube, and he could solve it at the speed of light. Plus, he made me laugh a lot. Unfortunately for me, the only time I got to work with John at any length was in April 1993 at the Lucasville prison riot and 10-day day stand-off, 11 miles north of Portsmouth in Scioto County. 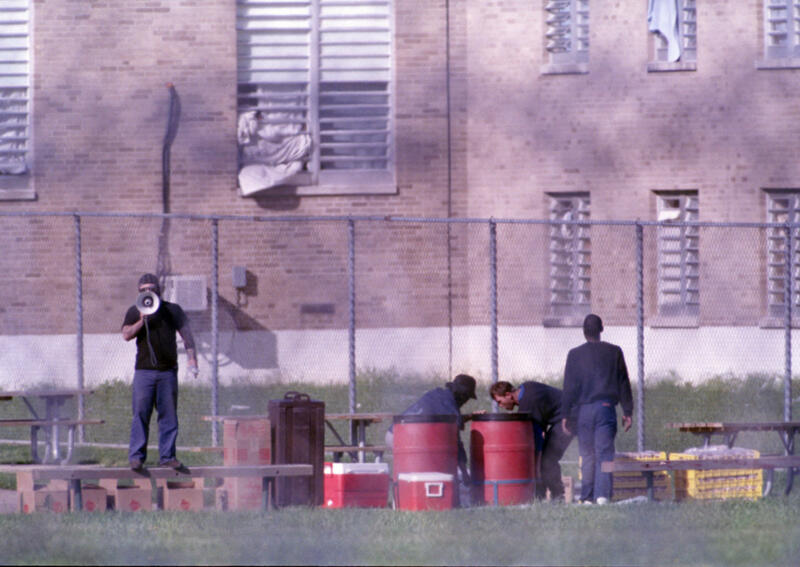 Prisoners at the Southern Ohio Correctional Facility in Lucasville remove food from the recreation yard outside the cell block where they held five guards hostage following a riot on April 11, 1993 -- Easter Sunday. It would become one of the longest in U.S. history. Over 11 days, nine inmates and a prison guard died. The riot broke out on April 11 – Easter Sunday – in Cellblock L of the Southern Ohio Correctional Facility in Lucasville, a maximum security prison. Probably the principal reason it broke out was that Muslim inmates feared that the prison officials were going to force them to have tuberculosis vaccinations, which would have violated their religious beliefs. Tensions were also running high among factions of the prison population, including the Muslims and the Aryan Nation. On the first day, rioters beat five other inmates to death and threw their bodies into the exercise yard. Over the next few days, four other inmates were killed by rioters. The rioters had taken eight prison guards hostage. The inmates strangled guard Robert Valladingham to death, trying to convince the prison officials to take their demands seriously. After state corrections officials agreed to review the prisoners' 21 demands, the rioters surrendered on April 21. Eleven days of death and destruction behind the walls of one of Ohio's largest prisons. Prison officials set aside a muddy field in the northeast corner of the prison property as a media "campground." It was several football fields-length from the prison itself, but with a pair of strong binoculars (which I had) you could monitor some of the comings and goings inside. Every major newspaper in Ohio (and even several small ones) began sending small armies of reporters to the mud pit, as we called it. And, of course, so too did the TV stations and the major radio news outlets. People were sleeping in dome tents, inside satellite trucks, in cars and sometimes on a dry patch of ground. Though there was little time for sleeping. News organizations, including the Enquirer, began snatching up the scarce motel rooms between Waverly to the north, Portsmouth and Wheelersburg to the south. This was the very early days of cell phone communication, and the Enquirer staff had two enormous mobile phones, which could only be used by punching in a special code before dialing the number. Later, we had the local phone company run a line out to the mud pit, and into the Range Rover of photographer Michael Snyder, which was used as a mobile HQ for the Enquirer staff. You could fit two or three people in the back of the Range Rover to catch quick naps. Of the 11 nights in Lucasville, I slept in a bed twice. And not for long. Enquirer staffers were streaming into the mud pit to join the crew, but most of them were wearing business clothes – women in dresses and heels, men in white shirts, neckties and wing-tip shoes. My friend and fellow reporter Ben L. Kaufman and I sort of inherited the roles of editors-on-the-scene, working in roughly 12-hour shifts. The only food in Lucasville was at a Subway and greasy sausages cooking on the rollers of a gas station/convenience store. After a rainy second night, the sun was out Day 3; things appeared to be quiet at the prison. Larry Beaupre had just been named editor of the Enquirer in December, so he was still learning the ropes of southern Ohio. But, that morning, he got in his car and drove to the mud pit. I was the first one he saw. What do you all need from me?, Larry asked. Money, and lots of it, I said. I've got to feed these people and get them some proper work clothes. Larry reached into his pocket and pulled out a rather thick roll of bills. He started peeling them off and handing them to me, one at a time. They all had a picture of Ohio's own Ulysses S. Grant. The man was giving me a stack of $50s! In all, $500. Uh, yeah, for now, I said, but if this goes on a while, you're going to have to come back. And bring that wad. After Larry left, I drove up the road to the Big Bear store outside Portsmouth and bought up all the cheap outdoor clothes and food I could afford. It was about this time that the honchos at Gannett News Service back in Rosslyn, Va., decided this was a national story and they dispatched Hanchette to the scene, along with Paul Barton, the Gannett News Service reporter who covered the Ohio congressional delegation. Of course, Hanchette managed to find his own motel room, even though it was in a cheap dump on U.S. 23 on the outskirts of Portsmouth. Kaufman and I had pretty good law enforcement sources on the ground in Lucasville and we got wind of the fact that a 27-year-old man named William T. Svette had just arrived in Lucasville from Georgia. He had driven all that way because his father – William J. Svette of Cleveland – was one of the prisoners who died in the early chaos of the prison riot. A prison guard who had been released by the prisoners had said that Svette and the other prisoners killed on the first day of the riot were "snitches" – informants who report on fellow inmates to the guards. His son, it was said, was not only heartbroken over the death of his father, but enraged by the charge that he was a snitch. The elder Svette had been behind bars in Lucasville since 1984, serving a 15 year-to-life sentence for felonious assault and murder. The story started making its way around the mud pit like a house afire. Soon, every news organization was trying to find the junior Svette to hear his story and the story of his father, whom he claimed could never have snitched – he was a Cleveland Teamster, a tough guy, a criminal of the old school who adhered to a code of honor. Hanchette and I jumped on the story. At first, we worked the phones, calling every motel within a 50-mile radius of Lucasville to see if he was registered. After that, we hopped in our cars and started going around the parking lots, checking for Georgia plates. We saw them, but they belonged to construction workers who were working jobs in Scioto County. Finally, at a Holiday Inn north of Portsmouth, I sat in the lobby pretending to read a newspaper, and saw a young woman I recognized as a reporter for the Dayton Daily News come in, stop at the front desk, show a press card, and tell the woman that a guest, Mr. Svette, was expecting her. I jotted down the second floor room number, and watched as she climbed the steps. I went outside and got the clunky cell phone, patched in the code, and called Hanchette. Dude, I got him. He's in a room at the Holiday Inn on Route 23 and he's in there talking to a Dayton Daily News reporter. Get over here. Sliding glass doors of the second-floor room opened out to a railing and a walkway to the stairs. There was a gap of about three feet in the curtains where I could get a good view if I walked by. So I did. What I saw was Svette sitting on the bed talking while the reporter was sitting on a recliner, taking notes. Now, the tricky part – getting him out of the clutches of the Dayton Daily News reporter and into our grubby hands. Hanchette, in his rental car, wheeled into the motel parking lot; he made it there from the mud pit in record time. I got in his car. You sure about this?, he said. Take it to the bank. See that pick-up truck? Georgia plates? We got out of the car and went into the lobby of the motel. Hanchette asked if there was a Mr. Svette there. The woman behind the counter said she would connect him with the room. The reporter answered the phone. John put on a southern accent and asked if he could speak to Bill. Bill, there's a call for you, she said. He got on the line with John. Mr. Svette, you don't know me but my name is John Hanchette and I write for USA Today. I have my friend Howard Wilkinson here with me, he writes for the Cincinnati Enquirer. Our papers write for the same company. Now, between the two of us we have a lot of readers. I know you are here because of your father and I am very sorry that he died in this mess. I hope you can get his body and take him home for a proper burial. And I know you want to clear his name of being a jailhouse snitch. We can help you do it…. How are you going to do that?, Svette said. Because we have people who read what we write. Important people. I know you are talking to the Dayton Daily News now. But let me ask you something – when you came into the motel, did you see all those newspaper boxes sitting outside? Yes, a bunch of 'em, Svette said. Well, there was one of the Columbus Dispatch, one of the Cincinnati Enquirer, one for USA Today, one for the Portsmouth paper. And plenty more. But the one you didn't see was the Dayton Daily News. Nobody reads that down here. Lots of people read the Cincinnati Enquirer. Even more read USA Today. Now, let me ask you, shouldn't you be talking to us instead of the Dayton Daily News? There was silence on the line for a moment and then John could hear him telling the reporter he had to leave for a while, but that he'd be back. Then, William T. Svette came down to the parking lot and hopped into the front passenger seat of my car. John piled into the back, and I drove us about five miles down the road to the Bob Evans Restaurant in Portsmouth. We took over a booth. Svette ordered up a giant breakfast – biscuits and gravy, scrambled eggs, some bacon on the side. And we had a bottomless pot of Bob Evans coffee. Svette told us his story and we scribbled it all down in our notebooks. He was a violent person, although never to his family. But he sure was no snitch. But ever since I was 5, he used to tell me "Listen, you little punk, you don't fink off on nobody." The younger Svette said that prosecutors had offered his father a plea bargain before the murder conviction to squeal on others, but he wouldn't even take that. Snitching, he said, was the last thing he would ever do – in fact, he called them rat finks. That's what he used to preach – Omerta. The word means to keep silent about crimes and not to cooperate with police. He said he couldn't get any information from officials about getting his father's body back; they kept telling him his father's body would not be released until the investigation was complete. We spent about 90 minutes with Svette before we drove him back to the Holiday Inn. Hanchette got his car and the two of us drove a couple of miles to the rag-tag motel where he was staying. We set a laptop up on the desk; John told me to do the writing. You're good at that; I'll read my notes and we'll write it all together. It took us less than an hour and we had a pretty darned good story. They slapped a headline on it: Father was not a snitch, son says; Lucasville inmate was murdered in prison. That night, when things had quieted down a bit, John and I sat out in the Range Rover, enjoying a cold brew. Suddenly, there was a very angry woman who had marched into our midst. It was the Dayton Daily News reporter. You two are the most horrible human beings I have ever met! You are despicable! That was my story! You're not real journalists! We were both trying not to burst out laughing. In fact, we had to laugh a little bit. Real journalists, the Pulitzer Prize winner said, are the ones who get the story.